This is a recently completed painting I have done. 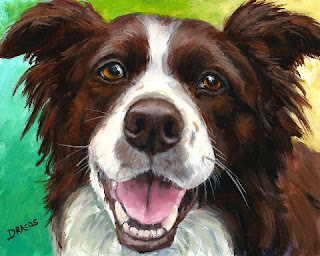 It's a liver or red border collie, and it's acrylic painted on an 8x10" mdf wood panel, one of my favorite painting surfaces. It will need to be framed, but glass isn't necessary. It's for sale on my website, $60 plus shipping. Here's the link to the page it's on. 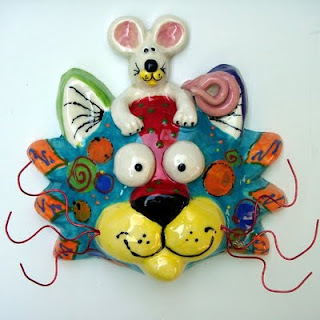 http://wildwildthings.com/pages/originalsgallerydogad.html. Just scroll down a bit and you'll see it, along with a few other recently finished paintings. (Sorry, I don't know why the following is underlined, and I can't change it.) I'm back in the USA for a while (really, really missing my family in Denmark, though). While I'm here, I'm trying to catch up on a lot of loose ends, one of which is I have a large number of people who have been requesting new or replacement dog, cat, fish, and other animal ceramic masks. So I have opened up the studio again and have made my first kilnload, which I have listed on Etsy. This time, though things are going to be a bit different: To make inventory control easier for me, this time each mask has its own unique identifying number, and thus each one is one of a kind. There will be one exception to that format, though, and that is if someone has contacted me about a broken piece that they want to replace, I will do my best to copy the piece as closely as I possibly can -- if you have photos of it. If not, you can describe it to me as best you can, and I'll try to come up with a close approximation for you. Anyway, if you're interested in a new or replacement ceramic mask, be sure either to check out the various places I'll be showing them (each place will have different items - sorry about that, but it's the only way I can think to do it without things getting really confusing. So the first kilnload, as I said, is on Etsy, and here's the link for those: http://www.etsy.com/shop/wildwildthings?section_id=10397779. The second kilnload will be on my website, http://www.dottiedracos.com. 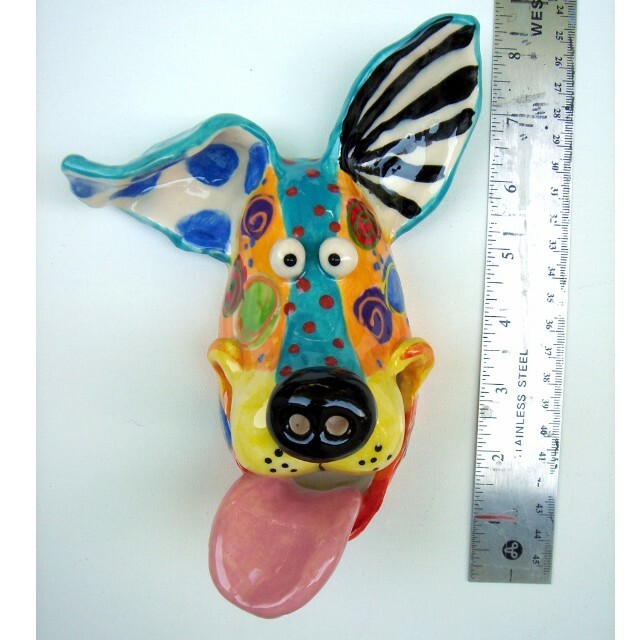 And the third kilnload will be at my Artfire shop, http://www.artfire.com/ext/shop/studio/LarkStudios. Once I've done all three venues, I'll start over in the same order with the next kilnloads. Each kilnload is around 15 pieces, and each kilnload takes about two to three weeks to complete. Here are a few examples of some of the pieces currently on Etsy. 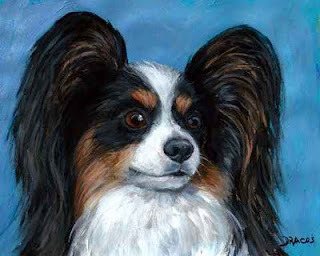 This is the long-overdue painting I did of a tri-colored papillon. I don't know why I had so much trouble with this little one, but at least I finally finished it. It's an 8x10" acrylic painting on heavy paper, so it'll need to be framed and probably matted. I'll have it for sale on my website, http://www.dottiedracos.com. I'm making final preparations for my trip back to the USA, which is really hard to do because I want to be able to work from both locations since I intend to live part-time in each place at least for the time being. It's turned out to be a bit more difficult than I had anticipated to ship items from Denmark to the USA, and I've even been losing all profit - and even going into the hole - from many of the prints I've been shipping from here. I'll figure it all out, though. 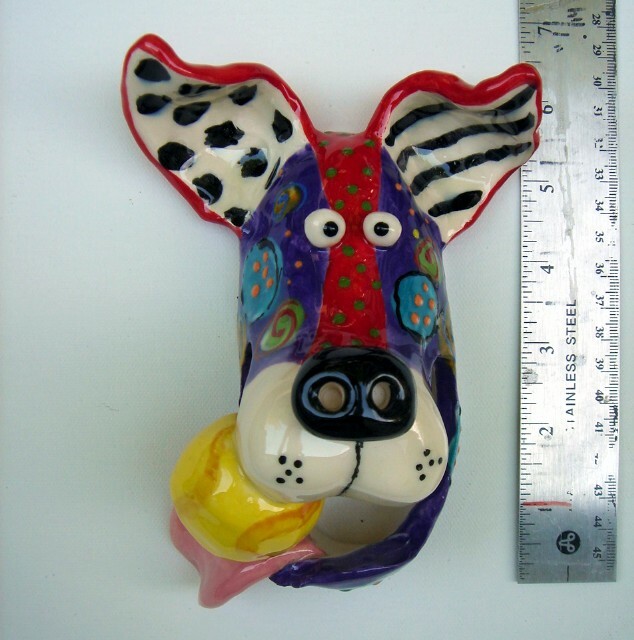 And my ceramic pieces that I'll be making in the US, they absolutely have to be shipped from the US for American customers because of their weight and the cost of shipping internationally. What I've arranged there is to complete the pieces while I'm there and then leave them with a family member to ship as they are ordered. So there will be a rather limited supply of them. This is a painting I finished right before I was leaving for Denmark. These are Tasie and Tierre, relaxing on the grass. One is an American Eskimo, and the other is a Rottweiler, both females. 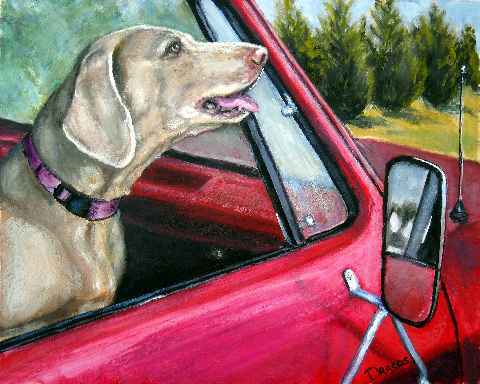 It was a pleasure to paint them, and I am so glad to report that the mom of these two was very happy with her two pups' portrait. 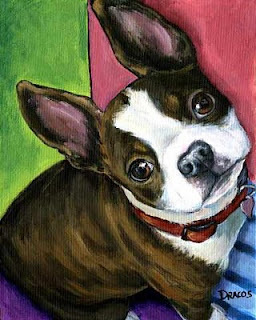 I have one more commissioned painting I will be doing, of two adorable terriers. Unfortunately, I still have to wait for my shipment from the US to get to all my paints, brushes, and canvas to be able to get to work on them. I started their painting before I left for Denmark, but I just wasn't happy with the way it was going. So, with the mom's permission, I asked for time to re-start the entire painting from a different point of view. That situation rarely happens with me; but when it does, I cannot be happy with what I think would have been a less-than-ideal painting, so I completely start anew! I'll share the results just as soon as I get the painting done. Here's the entrance to our farm. 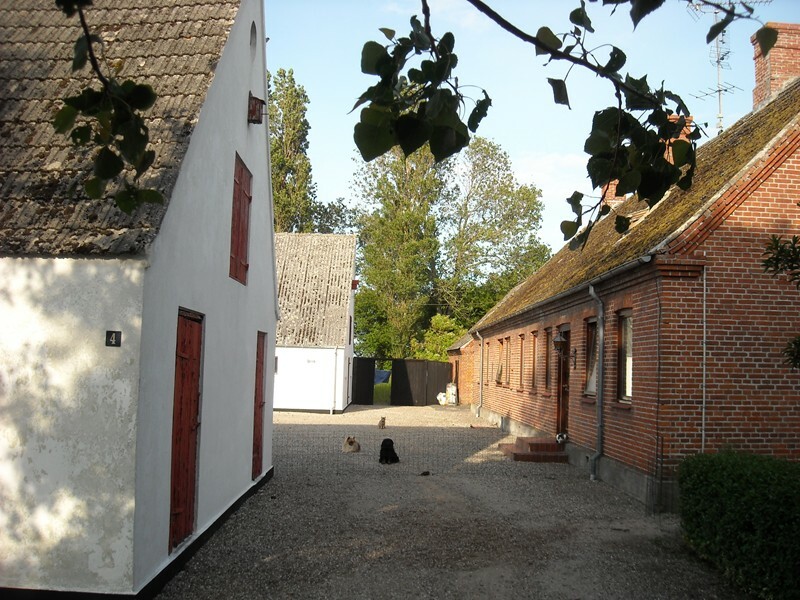 The house is on the right, and some of the barns are on the left. I'm standing at the end of a short tree-lined drive that is the entrance to the courtyard. The barn closest to me, on the left, is the one that borders the small road that curves past the front and western border of our place. I'll post more photos here later, or you can see even more photos at my facebook page. The two little dogs you can see in the photo are Sammy, on the right, our little black Cavalier King Charles spaniel, and on the left, my little sweetie, a pom-peke mix, I think, (who cares), named Harry Barker. We have another dog, too, Casey, a rat terrier mix, who is out of view. We also have three cats, a couple of whom are in the photo, I think. Their names are Maxine, Kayla, and Matilda. ﻿Several people have asked me to talk about how we have gone about getting to Denmark and about any tips I might be able to give. I really don't feel qualified to do so, but I'll give it a try, anyway. First, you'll see that one of the reasons I am not qualified is that we ended up in Denmark not because we just chose it and wanted to move here but because my son-in-law, Mark, is from Odense, Denmark. And it was his parents and brother who actually found this wonderful farm for us. Up until about a month ago, we still just wanted to move here but hadn't been able to find a perfect place to live. So not only Mark's family but their friends as well have been searching for a place for us to get. Just by coincidence, too, Mark's brother, Henrik, heard about this place through a friend just days after it had been placed on the market. We now live just minutes away from Henrik and his family, who live just an easily bicyclable few kilometers north of us on the same island of Langeland. Mark's parents live a little over an hour away from us in Odense, and we see them often. So as you can see, a lot of the work was already done for us before we even got here. But regarding the actual move, I can definitely give you a few pointers there, mostly what not to do. First, as we had very short notice about when we were to move (about three weeks), we had to act very quickly. Because we were going to bring all six pets with us, we had to get them flown out of the State of Florida because the summer heat got too hot in case they got left out somewhere after we relinquished them to the airlines. Well, actually, it was just the dogs we had to worry about because we carried the three cats onboard with us. Regarding the pets, first, it was very expensive to start off with. They all had to go to the vet to get microchipped (except Maxine the cat, who was already a world traveler), get health-checked, and certified as being so. The vet cost for all six was over $800. Then we had to download forms from the USDA that were required for each pet in order for them to be flown internationally, take those in to the USDA, then back to the vets for their signatures; that all cost a few hundred more dollars. And everything we did was time-dependant, too, so we had to keep a close watch on the number of days before our flights. We also had to buy flight-safe crates for each dog and airline-approved carriers for each cat. That was a couple more hundred dollars. Then we had to buy the tickets for the dogs to fly in cargo (very expensive, a couple of hundred for each dog as I recall - I'll verify that cost later on), and tickets for the cats to fly onboard, around $150 each, I think. Finally, as only two animals are allowed onboard in the cabin on any one flight, we had to take separate flights, with my going first, taking all three dogs in cargo and one cat under the seat. So I arrived in Denmark first and had to retrieve the dogs from cargo. That was probably the hardest part of this whole ordeal because I was really, really tired, and we had to wait around three hours to be able to get the dogs. Plus, there were more fees at the airport to get the dogs into the country, a couple hundred more dollars, I think it was. I had help with this stage because Mark's parents were there to pick me and all the animals up and take us to the farm. So what I learned from this part of the trip: I think of our pets as family members, so we had no choice but to take them, even though it was difficult and very, very expensive. 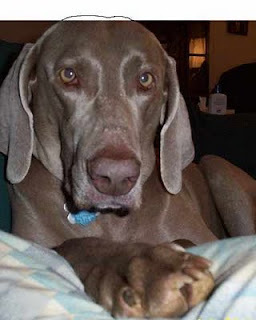 I will say this: All the animals, while probably horrified and miserable through the entire nearly 24-hour ordeal, forgot about it immediately and are none-the-worse for the ordeal. But one little bit of advice I can give you regards the cats in their carriers. First, don't feed or water them for many hours before the flight. Secondly, don't trust the little pads in the bottom of the carriers to manage any "accidents." The first time Kayla "pottied," there was nothing to catch the urine but the little useless pad in the floor of the carrier. So I took her and carrier into the airline toilet, ripped up tons of paper towels, and lined the bottom of the carrier very liberally with them. The next time, then, I was prepared. After she finished, I simply put a barf-bag over my hand, grabbed all the messed-up towels, pulled the bag back over my hand, with the soiled towels then inside it, tied it off, and threw it away. Very simple solution. Okay, that's the first part of my detailed description of our trip. I'll try to cover other matters later and add more pics as well. If you have any specific questions, just drop me a note and I'll do my best to try to answer them. Oh, also, I am still painting, but I still don't have any of my supplies other than just a few paints and brushes I threw into my luggage at the last minute. That's another story, by the way, shipping! 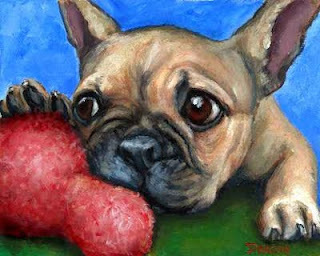 So for those of you who read my blog to hear about my paintings, hang in there and I'll get back to them just as soon as I get back up and running. I'm on a literary roll. Before I read "War and Peace," I read "Anna Karenina," also by Tolstoy. It, too, is a great book. It's a dark book for the most part but talks a lot, too, about the life of both gentry and peasant Russian people in the 1800's. In addition to a great, but tragic for some characters, story line, it discusses the class system in effect in the 1800's, how the lives of the various classes differed, how farms were managed, and generally about life and the different ways people choose to live it. Again, as with War and Peace, I highly recommend this book. Don't let the length of these books stop you; I promise you that you will want them to be even longer than they are once you are reading them. Another great, great (but oh-so-depressing) author I can recommend very, very highly is Emile Zola, an amazing French author who wrote mostly of the lives of ordinary - or even "sub-ordinary" - people in the late 1800's. Every single book I've read by him - and I've read many, many - has been great. But I might add that my family would always ask me when I was down if I was reading yet another Zola book. Some of my favorites have been: L'Assomoir, L'Oeuvre, Germinal, Nana, La Bete Humaine, just to name a few. Although I read them in French, I'm sure there are English translations easily available. Okay, that's it for now! I'm currently reading (or sometimes re-reading) a whole stack of Charles Dickens novels. The first in this list is "Bleak House." I'll give reports later. Comments? Okay, I know I'm way, way, way off topic with this post, but I just have to do it, anyway. I am a very, very avid reader, and I'm finally getting around to reading all the books I should have read long ago. So I'm going to mention just a couple right now and will add more as I have the time -- and if anyone is interested! I just finished yesterday Leo Tolstoy's "War and Peace," and I couldn't recommend it more! It was l-o-n-g! (Around 1300 pages). But, you know what? I kept checking to see where I was in the book because I wanted to see how much more time I could spend with this amazing author. I couldn't put it down! Well, I must add one thing, though: I couldn't put it down until I got to the epilog, which I must admit I struggled to get through. The first 1200-something pages were an amazing story -- and more, much, much more! The story centered around, both before and after, the War of 1812, fought between Napolean Bonaparte and Russia, which he invaded in his attempt to acquire all of Europe for France. But it wasn't only about the war and about war in general; it was about the lives of Russian people: their lives both before, during, and after this horrendous war. The epilogue was interesting, but it did require a lot of focus and concentration, something I often don't have for over short periods of time, especially as I read at night before I go to sleep each evening. It was generally about his analysis of what factors move historical events. He discusses the importance of rulers, generals, ordinary people, events at the time that may or may not affect the directions historical events take, etc. I highly recommend the book and would love to hear your comments on it if you've read it already or if you read it after my very, very brief review of it. Weimaraner Commissioned Painting Finally Completed! I've done something different this time with my commissioned painting posts: I'm showing you both the painting and the photo from which I worked. As you can see, I worked fairly directly from the photo but had to adjust the color a bit based on other photos I had of this beautiful dog. This was a really challenging painting for me, and it took me weeks to complete. She's a beauty, I think. Her name is Zoey. 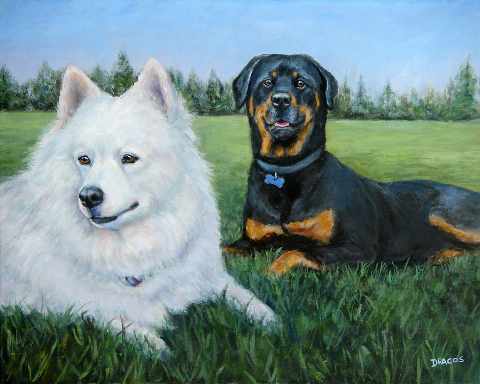 Okay, I love this painting of these two absolutely beautiful German shepherds. I just finished it about a week ago, and it was a commissioned painting. 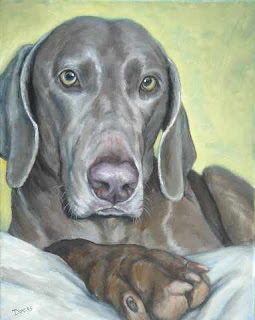 I now have another commissioned painting of a stunningly beautiful weimaraner on the easel that I've been struggling with for - no kidding - over two weeks. The lighting was bad in the original photo (indoor incandescent lights, flash, both really difficult to work with). Following the completion of this painting, I have two more commissions to do, both with between two and four dogs per painting. It's so hard sometimes - commissioned paintings, that is. In one sense, I love making someone happy by painting their very precious family member(s) for them. But for me as an artist, as I've mentioned multiple times before, it is a huge challenge. These are beloved members of a family, sometimes no longer living, so I must get them exactly right and do my very best to reflect their personalities, their beauty, their very lives on a piece of canvas stretched on some wood strips. It takes a lot out of me. With that being said, once again when these upcoming commissioned paintings are completed, I am going to quit taking any more commissions and spend more time on creating what I want to do, where I can be free to experiment, free not to "color within the lines", soar if I wish, get down low and sad if I need to. 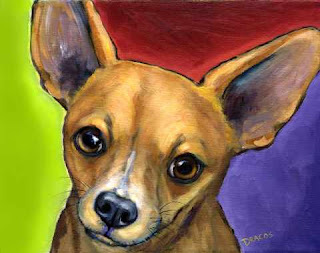 Those of you who have commissions pending with me, don't worry, I will paint them with the love and dedication I always show to all my commissioned works. But after these paintings, I really must take a break at least for a while -- again. 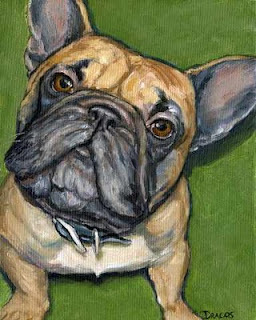 I will continue to request and accept photos of your pet for possible inclusion in future paintings; but if I use your photos, they will be in paintings done in whatever way I choose. Also, if I do paint your pet, I will continue to give you a free 8x10" print of the painting. And, of course, the original will be available for purchase by you - or anyone else if you don't want to purchase it - as well. This is a small sweet painting I finished last evening. I just have to take a little break from the customs from time to time; it keeps me fresher as I work on them, too, so it's a good thing in every way. This was a really fun painting to do, too, which helps. 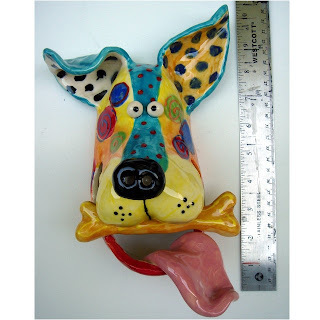 Short-haired dogs are fun to do because I can see the sculptural shape of their bodies - and in this case, the head. 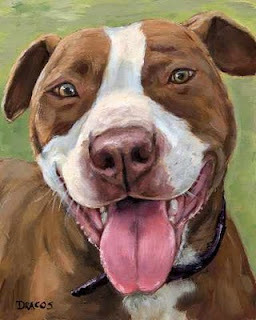 I've had a few pit bulls over the years, and for some reason, their heads always looked like bricks to me. I called all mine "brickheads." They're real sweeties. This one wasn't one of my pits but belongs to a customer of mine in Portland, OR. Just a quick note to let you know I'm working on commissions now and don't have time for other work. And they're rather complicated commissions, so they're each taking quite a bit of time. 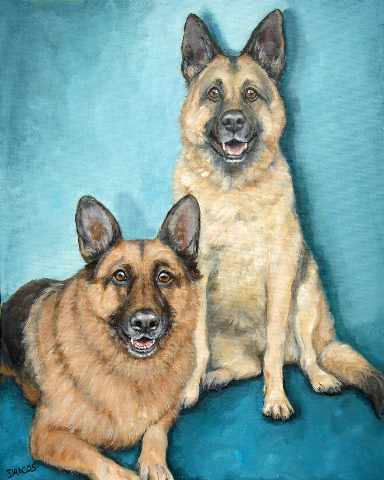 I'll show each one as it's finished, though, which should be sometime next week on the one I'm working on now, a painting of two German shepherds, both females. One of them is gone, and there aren't many photos of them, so I'm working with rather difficult circumstances. But I think they'll come out okay. 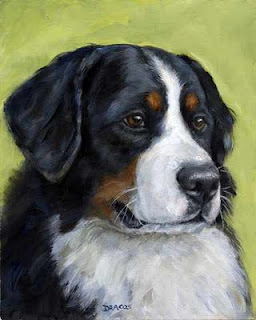 This is a handsome young Bernese Mountain Dog, Berner to those in the know, male I just finished yesterday, to go along with the other one, a female I did last week. This is a sweet Bernese mountain dog painting I just finished today. 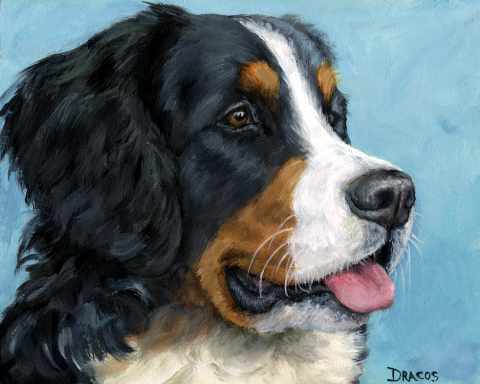 It was a really difficult one to do as it's actually a composite of several Berners. I'll be doing another one in the next week, too, so keep an eye out for it if you're a lover of Berners. Also, I've started on two German shepherds on the same canvas, a custom painting. 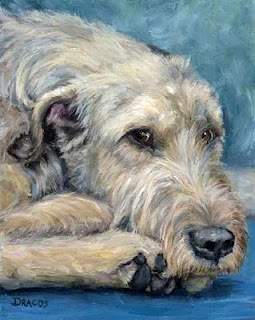 I'm looking forward to working on it as I love, love the look of the German shepherd. They make me start speaking in cliches: i.e., noble, handsome, elegant, etc. This is the greatest site I've found in a very, very long time: http://www.googleartproject.com/. It allows you to go into art galleries all over the world and see the paintings and cruise around the galleries. And, believe it or not, you can get up as close and personal as you want with a large number of the paintings. You can see the brush strokes - clearly!! You can see, for example, on some of Van Gogh's paintings, even some of his pencil markings. Not all, just a select number of them - but it's a great select number for sure! A hint for using the site: If you're like me and get motion sick at the slightest change in scenery, you can forego going through the galleries themselves and just go straight to the featured paintings in each gallery. Hope you enjoy it. Let me know what you think, okay? I just finished this painting this afternoon. Every time I do a long-haired dog, I say I'm going to take a break from them for a while. This one went a little easier than usual, but I still have an awful time with them. Maybe it's because I personally am partial to short-haired dogs. (Except!!! : My precious little sweetie name Harry Barker, a pekingese-pomeranian mix, about the cutest dog ever.) I'll have to remember to put up some photos of him soon. He really is just a little hairball running around the house, but really, he has a brain - a tiny one, but for a hairball, he's pretty smart! Hope you like my latest painting here. Next, I have several custom paintings I need to do, so I'll be working a lot harder the rest of this month. I'll be sure to post the results. I know that two of them are for German shepherds, one I don't know what it is yet, and then two terrier mixes after those three. It's going to be an exhausting month of March. Now I'm working on an Irish wolfhound, which I have never painted before. Bristly long-haired dogs always are a big challenge to me, so I'm trying to take it slowly on this one. I'm still here in Florida, and spring is already showing up - amazing! It's still awful in Oregon, as everyone who's ever lived there knows! I miss Portland but not the never-ending winter.